This Will be the Biggest Trend of the NEXT DECADE – Take Your Positions Now! Long-range trends are difficult to see if you’re just looking at what’s happening in the markets today. For investors, however, it’s essential to look beyond today’s hype and into the future – where will the real growth be tomorrow? What sectors will outperform and how can I position myself now? It takes a measure of objectivity, along with a ton of research, to see what lies ahead in the coming years. Most retail investors don’t have the time or energy to commit to this level of research. That’s why we do what we do here at Future Money Trends: dig deep into the markets and the statistics so you don’t have to. I’ve had my ear to the ground for quite a long time, looking for the big trend that will define the markets for the next ten years. All of my digging has led to one undeniable conclusion: the best trend for the next decade will most definitely be cannabis. Yes, I’ve been bullish on the cannabis market for a while, but the signals are flashing green more than ever. Cannabis legalization is taking the world by storm, with the epicenters being the United States and Canada. This movement is like a genie that can’t be put back in the bottle, and I have no doubt that the expansion of marijuana legalization is just getting started. 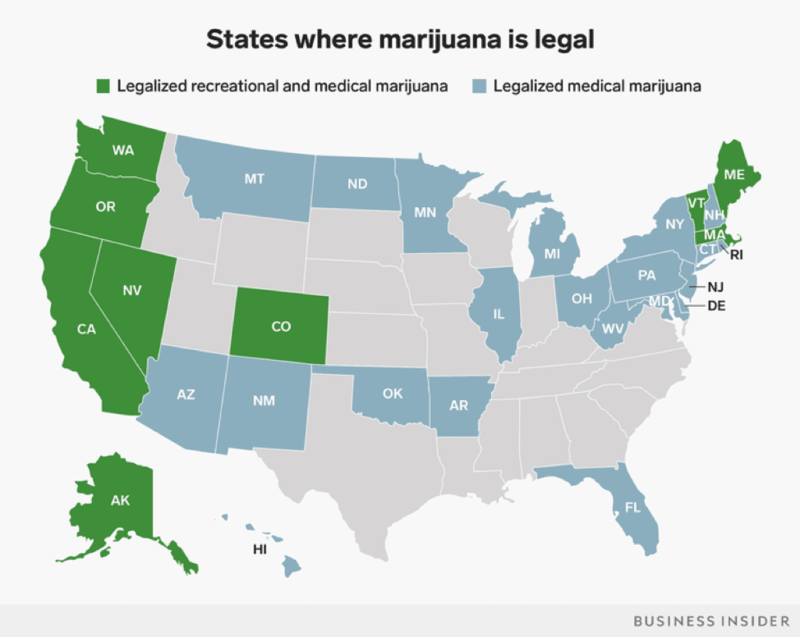 Given that 64% of Americans support legalization, it’s not difficult to extrapolate a future in which there will be a lot less gray in that map. 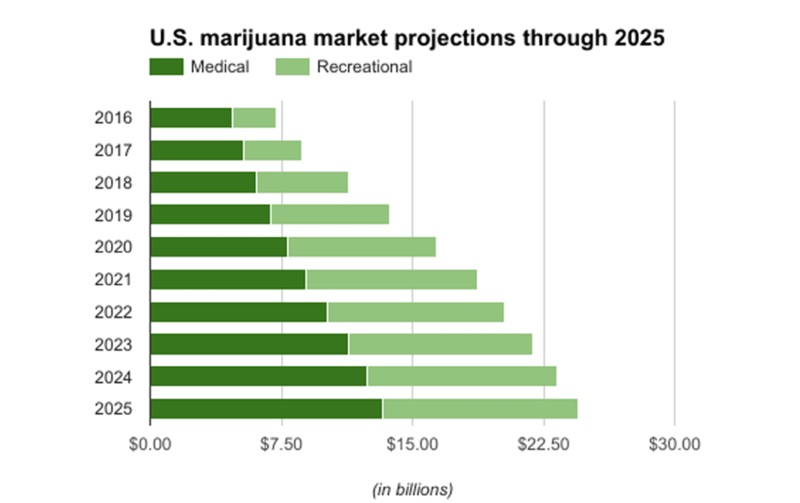 There’s plenty of room for growth in a nation in which 30 states have legalized medical marijuana use and only nine states and Washington, D.C. allow for recreational use. What do you think the map is going to look like in ten years? Sooner or later, laws always catch up to people’s attitudes, and attitudes are shifting irrevocably towards full legalization. Seriously, did you ever imagine in your wildest dreams that we would see headlines like this? You’ve got governors and health departments – that’s right, health departments– backing marijuana legalization. When a movement has this kind of backing, as an investor you want to be betting for it, not against it. You need to be on the right side of the trade, and if you’re on the short side of the cannabis trade, it’s time to strongly consider switching teams. Let’s not misunderstand: governments are not backing cannabis legalization because they’ve suddenly had a change of heart. Take the New York Department of Health, mentioned in the headline above, as an example. They’re well aware that legalization would provide massive tax revenues to New York, with estimates at $248.1 million to $677.7 million just in the first year. Still, even if the rationale is self-interest, it’s still a force to be reckoned with. The powers that be are moving towards full legalization, which is inevitable and likely to happen sooner rather than later. 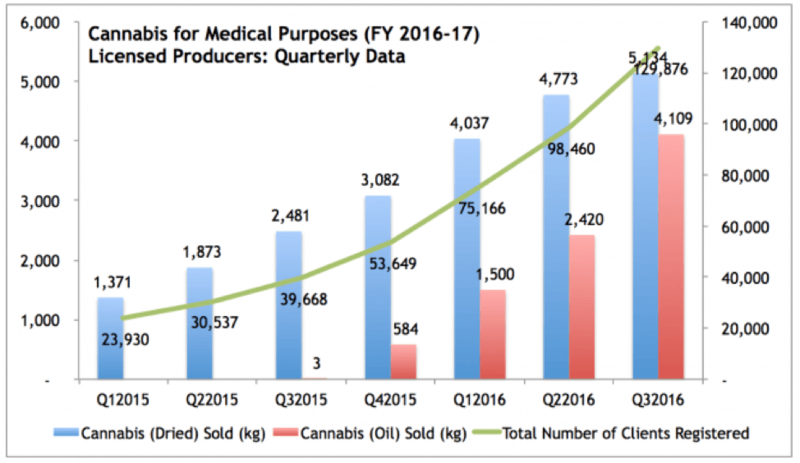 As shown in the graph above, just the medical side of legalized cannabis in Canada is making big strides and I don’t see any signs of a slowdown. There are sizable leaps and bounds in year-over-year sales of both the dried and oil forms of cannabis in Canada, and the total number of registered medical clients is growing as well. Statistics Canada has stated that more than 400,000 people in Canada use cannabis for medical reasons, and as the cannabis movement gains more traction, we should see these numbers get bigger and bigger. There’s just no way around it. It’s as good a time as ever to take a position in what will clearly be the dominant market for the next ten years: legalized cannabis. Look for a full update next month on the top 5 cannabis plays that we want to own!